Heat oven to 350°F. Line 15x10x1-inch pan with heavy-duty foil. Spray foil with cooking spray. Spread cereal evenly in foil-lined pan. In 2-quart saucepan, cook and stir butter and brown sugar over medium heat until butter is melted. Heat to boiling, stirring frequently. Reduce heat to medium; boil 5 minutes longer, stirring frequently. Immediately pour brown sugar mixture evenly over cereal in pan. Bake 14 to 15 minutes or until bubbly. Sprinkle chocolate chips on top of cereal mixture. Let stand 5 minutes. Spread chocolate evenly over cereal mixture. Sprinkle with toasted almonds. Cool completely, about 30 minutes. Refrigerate about 20 minutes to set chocolate; break into pieces. Store covered in refrigerator up to 1 week. 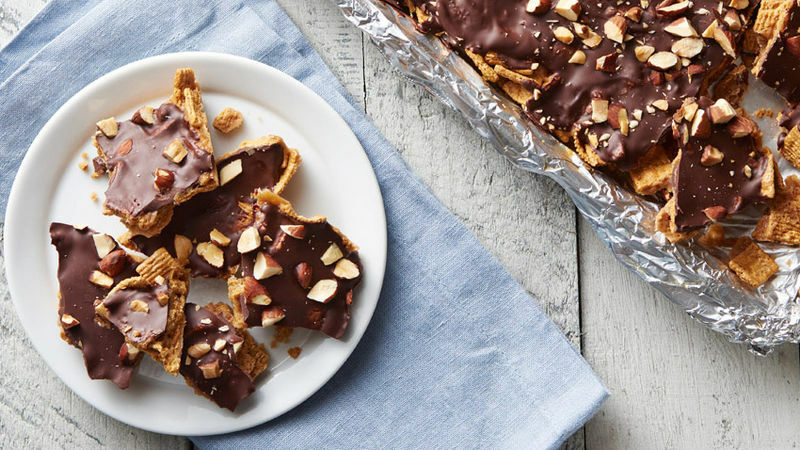 For more toffee flavor, sprinkle chocolate with toffee bits.